Police have arrested ten residents of Lusaka’s notorious Chibolya compound for stoning Drug Enforcement Commission officers who were conducting an operation in the area. Lusaka Province Police Commissioner Lemmy Kajoba says Chibolya residents on Sunday turned violent and descended on DEC officers who have been conducting a two day operation in the area. Mr. Kajoba says the ten Chibolya residents have been arrested for stoning the DEC officers and torching two vehicles which were not even part of the operations. 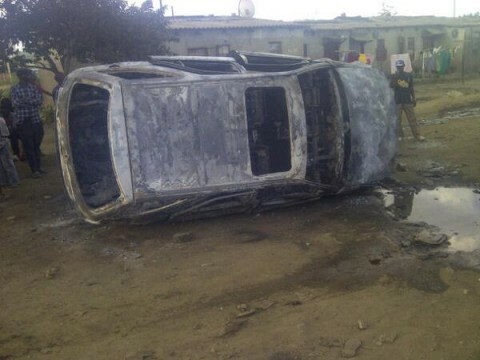 He has disclosed that a Flash minibus and a Toyota harrier were torched when the residents turned violent. Mr. Kajoba says the Zambia Police Service is disappointed with Chibolya residents for not cooperating with security agencies. He has warned that a well-coordinated and robust operation will soon be embarked on to get rid of all criminal activities in Chibolya. Mr. Kajoba has told ZNBC Paul Shalala in a telephone interview that Chibolya cannot be allowed to be a no go area for security agencies and soon all criminal activities will be brought to a halt.